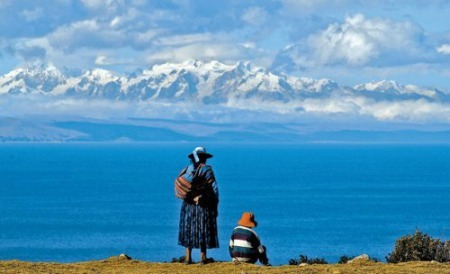 Here is a basic 7 day tour that includes Lima, Cusco/Machu Picchu and Lake Titicaca. Pricing is with group day tours. It can be modified to suit your interests, such as if you arrive to Lima in the morning, want private day tours, more days and day tours, etc. We can also add on extensions to the Amazon and other areas. Flights are not included in prices. Day 1. Arrival to Lima in evening, overnight at Costa del Sol Airport hotel. Day 2. Breakfast. Fly to Cusco, arrive to Cusco and transfer to your hotel. In the afternoon visit the Cathedral built from 1560 to 1654 at the site of the Viracocha Inca palace. It is the best example of the European art done by natives of Cusco, has the high altar plated with silver and contains masterpieces of woodcarvings and painting. See the Koricancha, which displays the best Inca stonework in Cusco. Explore the ancient Indian sanctuary of Sacsayhuaman with magnificent Inca walls of massive rocks weighing up to 130 tons fitted together with absolute perfection. The amphitheatre of Qenqo, the fortress of Pukapukara and the spring shrine of Tambomachay where water still flows by a hidden channel out of the masonry wall are also visited. Day 3. Breakfast. Full day visit to the Sacred Valley. The Pisac Market is a colorful morning market where you can purchase Peruvian weavings, jewelry, and pottery, and see its traditional Indian market where goods are traded. Visits to Pisac are on Sundays and Thursdays. After lunch we visit Ollantaytambo, the Inca town on which the present day town is based is clearly seen as a fine example of the traditional Inca City planning of Canchas or blocks, which are almost entirely intact and still occupied. 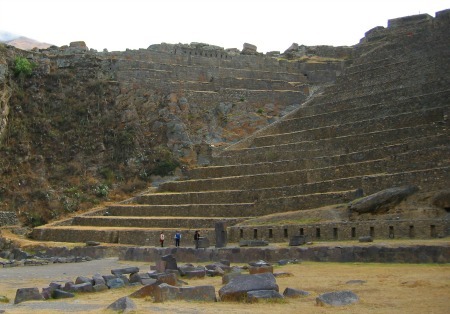 The tour includes visits the village, terraces, temples, irrigation systems, granaries, the fortress and the temple of the Sun built by Pachacuty Inca, using Colla Indians from Lake Titicaca..
Day 4. Breakfast and Lunch. Machu Picchu, the lost city, is a complete city, set on a high mountain with terraced slopes falling away to the Urubamba River. For centuries it was buried in jungle, until Hiram Bingham stumbled upon it in 1911. Professional tour guides will explain about the history of the site and lead you through; staircases, terraces, temples, palaces, towers, and fountains. Afternoon transfer back to Cusco and transfer to hotel. Andahuaylillas: "Sistine Chapel of America": The church is of simple construction, made of thick adobe mud-brick walls, common in colonial buildings, and features a relatively modest structure: a single nave with a bell tower and a façade with two solid stone columns that stand out against the others around the main entrance. While the exterior of the church looks rather humble, it is the interior, that makes this one of the most valuable jewels of the colonial art in Peru, sometimes called the "Capilla Sixtina" or "Sistine Chapel" of America. Raqchi: "Temple of Wiracocha" The most prominent structure is the Temple of Wiracocha, an enormous rectangular two-story roofed structure that measures 92 metres (300 ft) by 25.5 metres (84 ft). This structure consists of a central adobe wall some 18 to 20 meters in height with an andesite base. Windows and doors allow passage. It is flanked on each side by a row of eleven columns. Raya Pass: This is La Raya pass Mountain views, 4310m - 14172 ft above sea level, here we have the chance to get out and breathe the air and take some photographs of grazing llamas and alpacas extend to the broad Altiplano horizon. This point is the conjunction of the cordillera and the origin of the Vilcanota knot. Pukara: "Museum of Pukara" Located 106 kms from the city of Puno. People of potters, which retains the name of the first civilization of southern Peru, which dates back to 1600 years BC and archaeological remains of which, besides its lithic and ceramic pieces are exhibited in the Museum site. Pucara Puno, Has its origin in the Late Formative Period (200 BC – 200 AD) around Titicaca Lake in the Collao Plateau, was one of an Aymara speaking cultures that flourished in that region. Guide and lunch included. Transfer to hotel in Puno. 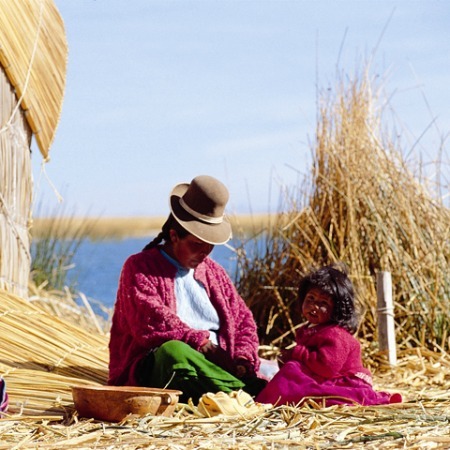 Day 6 - Morning visit to the Uros Islands by speed boat, to lessen time on lake. These islands are made of reeds, rising six meters above the lake level. They are anchored by logs and connected to each other by ropes. The main activities of the people who live here are fishing and handcrafting several items that they sell to visitors. Continue to Taquile Island which has two essential characteristics; its geography, offering a spectacular view from its hills, and its standing as a first-rate textile center. Taquileños live on their textile activities. This can easily be seen in the men walking about in rubber sandals ("ojotas" in quechua), wearing black pants, white flannel shirts and beautiful, finely woven chumpis (belts), covering their heads with finely knitted warm "chullos" (caps with ear flaps). Box lunch included. Can quote with other hotels or with private day tours. Subtract $52 per person if you prefer the slower boat on the lake tour. We can also subtract a bit if you don't want to visit the Sillustani Funeral Towers. ​Prices include airport transfers, hotels with breakfasts, group tours mentioned, entrance fees, 4 lunches.